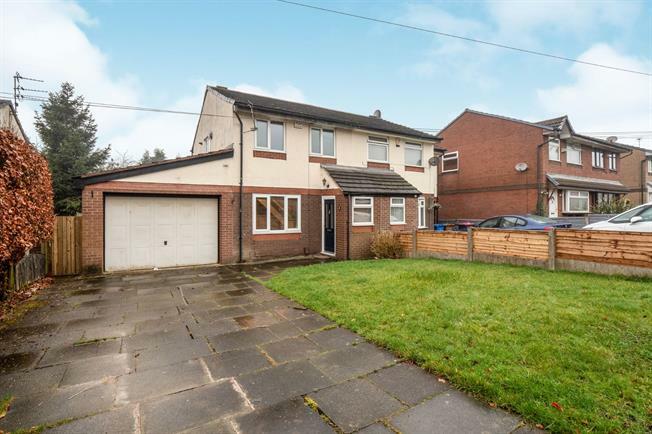 3 Bedroom Semi Detached House For Sale in Manchester for Offers Over £175,000. This recently refurbished three bedroom semi detached property is a must see for all buyers, set back from the road and extremely well presented throughout. The property features a spacious lounge/dining room separate modern fitted kitchen, attached large double garage with utility area are all located on the ground floor. Three bedrooms are complimented by a fitted modern bathroom. There is a good sized garden to the front and rear with off street parking leading to a double garage to the front. This is an ideal home within a fantastic location to suit all buyers. Composite front double glazed door, opening onto the garden. Double glazed UPVC window facing the front overlooking the garden. Laminate flooring, dado rail, textured ceiling, ceiling light. Double glazed UPVC window facing the front overlooking the garden. Radiator, carpeted flooring, under stair storage, dado rail, textured ceiling, ornate coving, ceiling light. Double glazed UPVC window facing the rear overlooking the garden. Radiator, laminate flooring, dado rail, textured ceiling, ornate coving, ceiling light. UPVC back double glazed door, opening onto the patio. Double glazed UPVC window facing the rear overlooking the garden. Radiator, laminate flooring, part tiled walls, textured ceiling, ceiling light. Roll edge work surface, fitted wall and base units, single sink with mixer tap and drainer, integrated electric oven, integrated halogen hob, stainless steel extractor, space for fridge/freezer. Attached garage; power light and utility area with sp[ace for washing machine and fridge freezer. Loft access . Double glazed UPVC window facing the side. Carpeted flooring, built-in storage cupboard and boiler, textured ceiling, ceiling light. Double bedroom; double glazed UPVC window facing the front overlooking the garden. Radiator, carpeted flooring, built-in storage cupboard, textured ceiling, ornate coving, ceiling light. Double bedroom; double glazed UPVC window facing the rear overlooking the garden. Radiator, carpeted flooring, textured ceiling, ornate coving, ceiling light. Single bedroom; double glazed UPVC window facing the front overlooking the garden. Radiator, carpeted flooring, textured ceiling, ceiling light. Double glazed uPVC window with opaque glass facing the rear overlooking the garden. Radiator, laminate flooring, part tiled walls, textured ceiling, ceiling light. Low level WC, panelled bath, pedestal sink. Enclosed large gardens to rear with raised patio, lawn area with boarders containing mature plants shrubs and bushes. Ample parking to the front leading to a large double garage, lawn area and boarders.